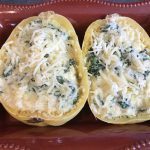 This vegetable dish can be served in the spaghetti squash shell as a “boat” or out of the shell on a plate, depending on the presentation you want to make. 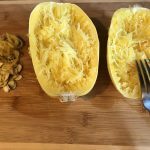 The spaghetti squash can be prepared and cooked in advance or while you’re cooking up your meal. The squash can be boiled or baked – and in this recipe, it is baked. Start with slicing the squash in half. If you want to soften it before cutting, you can microwave it for about 3 minutes. (be sure to pierce it in several places so it doesn’t burst). Rub the squash with a little olive oil and place face down on a baking sheet for 30-40 minutes (or until tender). After the squash is cooked (and cooled), Spoon out the seeds. Use a fork to separate the strands of spaghetti. Cook the spinach and sauce while the spaghetti squash is baking. 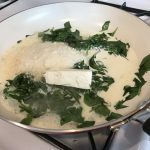 Start with slightly cooking the cut-up spinach in olive oil in a large pan until wilted. 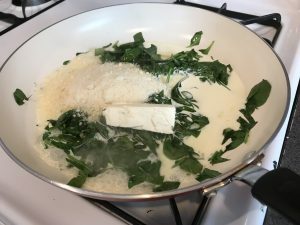 Then add the cream, cream cheese, parmesan cheese, and garlic. Stir until blended. 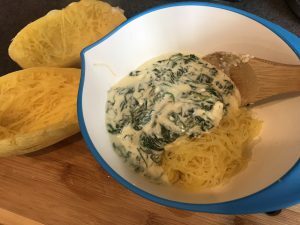 Place the spinach sauce in a bowl and add the spaghetti squash. Stir the ingredients together then scoop the mixture back into the shell of the squash. Bake at 350 for 15-20 minutes. You can also serve out of the shell on a plate. Top with mozzarella cheese and some additional parmesan cheese on top, if desired. 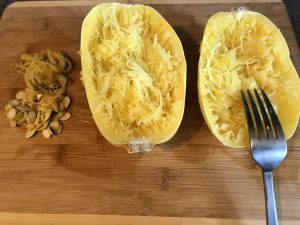 The squash can be boiled or baked - and in this recipe, it is baked. Start with slicing the squash in half. 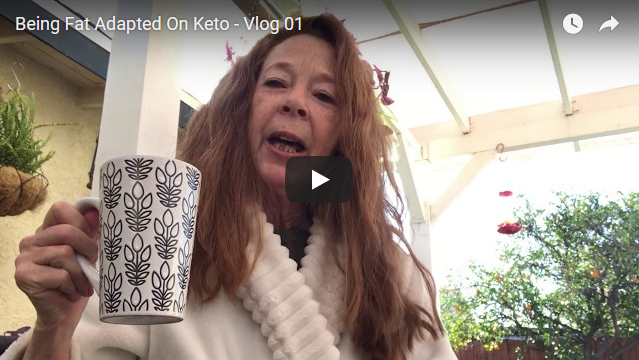 If you want to soften it before cutting, you can microwave it for 3 minutes. (be sure to pierce it in several places so it doesn't burst). Rub the squash with a little olive oil and place face down on a baking sheet for 40 minutes (or until tender). After the squash is cooked (and cooled), spoon out the seeds then use a fork to pull out the strands of spaghetti. 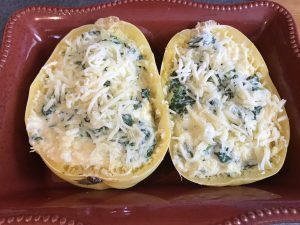 Cook the spinach and sauce while the spaghetti squash is baking. 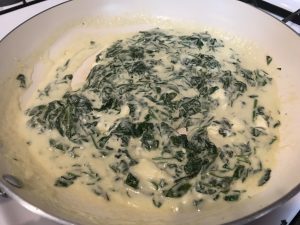 Start with slightly cooking the spinach in olive oil in a large pan until wilted. Then add the cream, cream cheese, parmesan cheese, and garlic. Stir until blended. 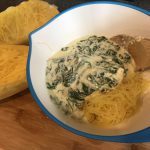 Mix the spinach and sauce with the forked spaghetti squash until blended. Scoop out the mixture into the shell of the squash and mix. Bake at 350 for 15-20 minutes. You can also serve out of the shell on a plate. Top with mozzarella cheese and some additional parmesan cheese on top, if desired. 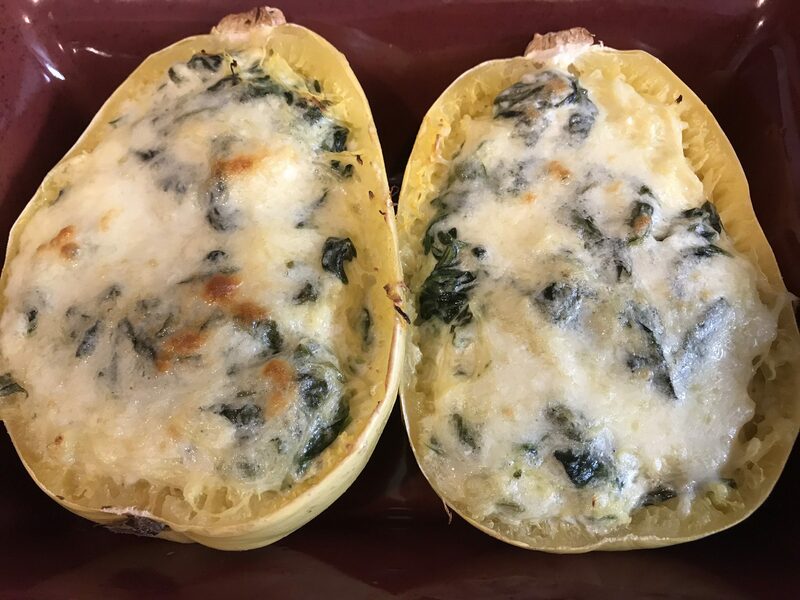 This can be served in the shell of the spaghetti squash, or out of the shell on a plate.